One of the eras that Legends of Tomorrow crew will be visiting on their temporal journey is the Old West. While there, they’ll run into DC Comics’ most famous cowboy, Jonah Hex. When his inclusion was announced last week, there was no word on who would play him, but now it’s been announced that Ray Donovan alum Johnathon Schaech has been tapped to portray the ugly anti-hero. Viewers will see Schaech’s Hex in Episode 11, and when you imagine him with one side of his face mangled, he looks like a great match to the comic book version. There were also some extra details on how the cowboy will factor into the show. Described by EW as a “morally ambiguous gunslinger with a penchant for danger,” he’s already had experience with time travel and the future, but the Wild West is where he’s most comfortable. Having been battling outlaws and gangs for a long time, he’ll warn the Legends of Tomorrow protagonists to be careful when they arrive near the small town of Salvation. Knowing him, he’ll eventually jump into the action with the guns blazing when the team needs a last minute assist. Jonah Hex made his comic book debut in 1972 as a former Confederate soldier who was now making a living as a bounty hunter. While his gun skills and gruff attitude are enough to make a name for himself, it’s his disfigured visage that turns heads. The right side of his face was scarred when he was branded with the “Mark of the Demon” (a.k.a. a hot tomahawk) by an Apache tribe that he grew up with after he killed one of their members, though he said it was in self-defense. Although the majority of his stories take place in the Old West, he’s had plenty of experience teaming up with the present day DC heroes and even going to the future a couple times, most recently in his own New 52 series. Outside of the comics, Hex was played by Josh Brolin in the 2010 Jonah Hex movie, which earned negative reception from critics and fans alike. In the world of animation, the character’s appeared in Batman: The Animated Series, Justice League Unlimited, Batman: The Brave and the Bold and, most importantly, his own animated short film DC Showcase: Jonah Hex, where he was voiced by The Punisher actor Thomas Jane. 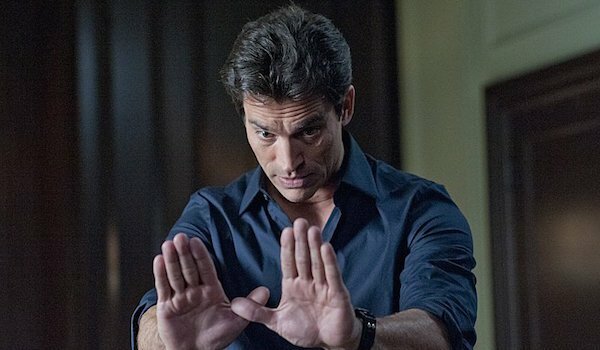 Schaech is best known for playing Sean Walker in the Showtime series Ray Donovan. His other credits include The Client List, Star-Crossed and Texas Rising, and he’s currently recurring as Michael Parrish on ABC’s Quantico. Jonah Hex has a dedicated fanbase, so if Legends of Tomorrow earns a second season, and if the show retains the time travel element, then it’s entirely possible Schaech may reprise Hex in the future…and as I write that, I realize that could even mean Hex being taken to the 20th, 21st or even 22nd centuries. Legends of Tomorrow premieres this Thursday at 8 p.m. EST on The CW.